Designed — The practice is deliberately engineered in order to foster desired business outcomes – not based solely on the tried and true. “We’ve done it successfully that way for years,” is not an acceptable rationale. Top organizations do their homework and create practices that address opportunities for business improvement. They don’t rest on their laurels, either. Any best practice must be subject to periodic review and evaluation. Practices that may be optimal now may soon prove to be insufficient as methods and markets evolve. Here’s a clue: If the practice can be found in a textbook, it’s most likely obsolete. Conscious — Professionals in the organization are clearly aware of the practice, the reasoning behind it, and how it contributes to better performance outcomes. That means continuous education and training are essential elements of every best practice. “Institutional knowledge” is not good enough unless it is systematically shared across the team and embraced by its members. The enemy of best practice is inertia; consciousness is its friend. Measurable — Practice outcomes can be tracked, measured and evaluated using routine processes embedded within the business process itself. Performance is everything, and rapid response is crucial. Business activities happen in real time and our evaluation of those activities must also. The days of”post-mortem” reports on spreadsheets are over. Insights without an associated and timely mode of action are are little use. Reserving business intelligence for senior management is an outdated idea. At every level, associates need a continuous view into their individual performances and their impact on team and organizational results. Realistic — The practice is made achievable by clear objectives, systems and tools that enable repeatable success and transparency. Organizations must define a best practice in both functional terms and value terms that make it compelling to the individuals who do the work. The benefits must be worthwhile and the goals must be made achievable. If it is hard to do, then organizations must invest to make it easier to comply. Today that often means technology and policies that eliminate needless tedium while clearing away obstacles to individual and team success. Customer-Focused — The practice is designed and focused on a primary objective of delivering on the needs of the end customer. In retail, it’s the shopper. In other organizations, the immediate customer may be another business entity or even an internal client. The principle remains the same, regardless. A practice that is designed, consciously adopted, realistically applied and made measurable with the ultimate customer in mind will tend to rise to the top and deliver superior results. These five key traits may not be a sufficient framework for business leaders in some industries. It doesn’t attempt to address the morality, legality, fairness or safety of the practice, but I take that as a given. It may be more retail/marketing-oriented than operational/manufacturing oriented, but that’s where I hail from, so interpret accordingly. In the end, “best practice” will always be a subjective label applied to business processes that reflect the best know-how we have in this moment. 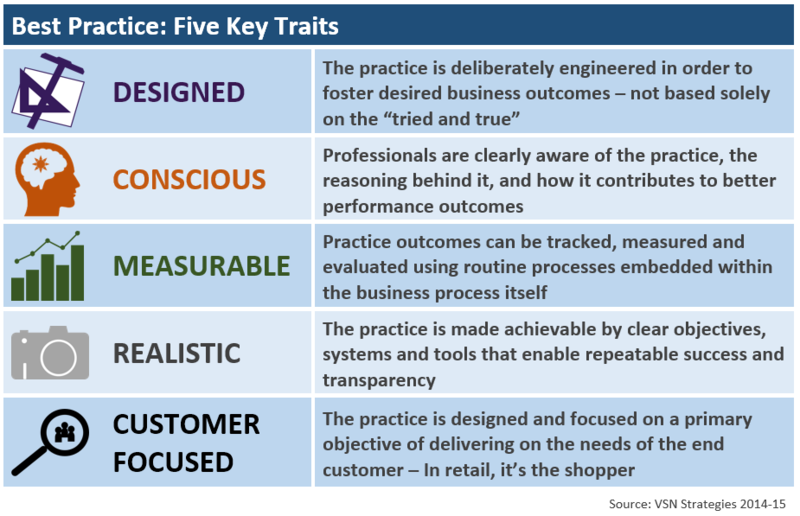 Regular and objective evaluation of your best practices against the five key traits might be a best practice we can all adopt. 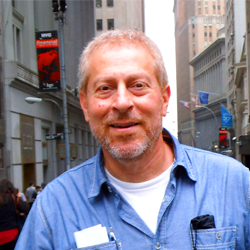 Hello James: I greatly enjoyed reading this post! I recently wrote a white paper on best practices for our in-store consumer marketing services business, and could not agree more with your assessment of the five key traits. Nicely-done piece, Kathleen. I think my readers will find it very useful as a tangible example of how best practice content can serve B2B marketers. And thanks for the compliment!